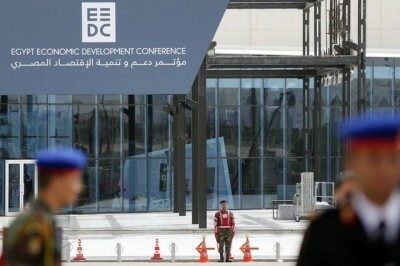 Global investors and political officials gathered yesterday in the Red Sea resort town of Sharm el-Sheikh for the opening of a three-day Egypt Economic Development Conference, pledging to invest billions of dollars in the bloody military junta of General Abdel Fattah al-Sisi. Hundreds of top officials and CEOs attended, including US Secretary of State John Kerry, Italian Premier Matteo Renzi, and Chinese Commerce Minister Gao Hucheng. The event followed by less than a week the first execution in Egypt of the nearly 1,400 Islamists condemned to death in summary trials held last year by the Sisi regime. With Washington leading military interventions against Islamist forces across the region, notably in Iraq and Syria against the Islamic State (ISIS), Sisi promoted the Egyptian army as an anti-Islamist force, having ousted Egypt’s Islamist president, Mohamed Mursi, in a bloody coup in 2013. “The stability of Egyptian society is stability for the region as a whole. Egypt is a model of tolerant morals, a country that denounces extremism and violence,” he declared. As officials and media commentators hailed Sisi for returning “stability” to Egypt, the Persian Gulf sheikdoms of Saudi Arabia, Kuwait and the United Arab Emirates pledged to invest $12.5 billion. Transnational corporations, including British Petroleum, General Electric and Alsthom, lined up for lucrative energy and industrial contracts, including the development of the giant West Nile Delta (WND) gas field, the construction of gas-fired power plants in Suez City, and an extension of the Cairo subway. Major international banks and corporations are creating jobs in Egypt only because they assume that ongoing political terror will guarantee low wages and high profits. Egypt’s “investment climate,” praised by BP, is one in which workers’ protests for back wages or wage increases are brutally attacked by security forces, which have detained and tortured tens of thousands of prisoners and shot thousands of peaceful protesters in the streets of Cairo. Hundreds of strikes and workers’ protests under the Sisi junta last year culminated in the shooting of seven workers and jailing of eight last September, when police broke up a protest demanding back wages at the Abod textile factory in Alexandria. Workers’ protests continue, however, amid deafening silence in international media. On Thursday, AP reporters spoke to Tarek Tabl, a 52-year-old construction engineer leading one of a series of workers’ protests outside government offices in Cairo, shortly before police attacked and dispersed the protest. Tabl criticized investments that went to privatize the construction firm where he works, leading to mass layoffs. “This is the type of investment that is producing only unemployment and chaos,” he declared. What attracts investors to Egypt are the super-profits that can be drawn from a work force facing relentless repression in an economy where monthly wages can be as low as 1,000 to 1,700 Egyptian pounds ($131 to $220). “This part of the world is blessed with a stunning amount of commercial potential,” Kerry said at an American Chamber of Commerce event Friday morning before traveling to Sharm el-Sheikh. He said US firms, which invested $2 billion in the Sisi junta last year, stood ready to help the Egyptian economy. Kerry met with Sisi, Palestinian President Mahmoud Abbas and Jordan’s King Abdullah for discussions on the regional political situation before speaking at the Sharm el-Sheikh conference. There, he praised the role played by Egypt in the “war on terror,” which includes the bombing of Islamist forces that have taken control of portions of Libya since the NATO-led war in 2011 that toppled Colonel Muammar Gaddafi’s regime. The calculations involved in the conference were perhaps most bluntly laid out by Italian Prime Minister Renzi, who said he viewed both Sisi’s war on Islamism and the prevention of a new revolutionary upsurge of the Egyptian workers as key strategic interests of European imperialism. Renzi’s comments point to the class conflicts that are developing under the surface not only in Egypt, but internationally. He is well aware of explosive opposition in the Italian and European working class to the European Union’s austerity policies, which similarly aim to impose free market policies and poverty wages on workers. Renzi is bluntly warning that a new revolutionary uprising in Egypt could spread not only throughout the Middle East, but also to the United States and Europe. A further indication of the social physiognomy of transnational corporate elites is provided by the investment law passed by the Sisi junta earlier this month. It is designed primarily to give investors immunity from prosecution for various types of criminal behavior. Its signature measure is a provision preventing corporate executives from going to jail for criminal behavior by their corporations. The initial stages of the Egyptian revolution in 2011 saw widespread demands by workers for the prosecution of criminal behavior by corporate executives and leading officials at state-owned enterprises. “We cannot keep prosecuting company CEOs in cases where the company is accused of wrongdoing and sending them to jail,” Mohamed El-Sewedy, the head of the Federation of Egyptian Industries, told Ahram Online. He added that he was satisfied with the final draft of the law. The law also sets up a single General Authority for Investment (GAFI), which will act as a rubber stamp for investment projects. Investors can require the government to process an application to liquidate their investments, should they decide to leave Egypt, in 120 days. The law also establishes new, looser regulations for real estate sales, following court rulings upholding challenges to the legality of several high-profile land deals. The conference at Sharm el-Sheikh is a warning not only to the Egyptian, but also to the international working class. The issues of social equality and the struggle against class oppression that led to the revolutionary uprising against Mubarak in 2011 were posed in Egypt, but they could not be resolved within the borders of one country. Workers in Egypt and around the world, including in the wealthiest countries, face the same challenge: progressive social change can come only through a revolutionary struggle of the working class for socialism. Capitalism has reached a social and political dead end, offering nothing but escalating wars and attacks on the living standards of the masses. The easy embrace of the Sisi junta by Western officials is a warning that the military methods for suppressing internal opposition employed by Sisi are being prepared not only in Egypt, but internationally—including in Europe and America.